Femme Motorcross Jacket: We took the timeless motorcycle jacket and gave it a chic, modern twist by adding pretty pleating and embroidered sequins. It’s the perfect mix of edgy-meets-sophisticated. 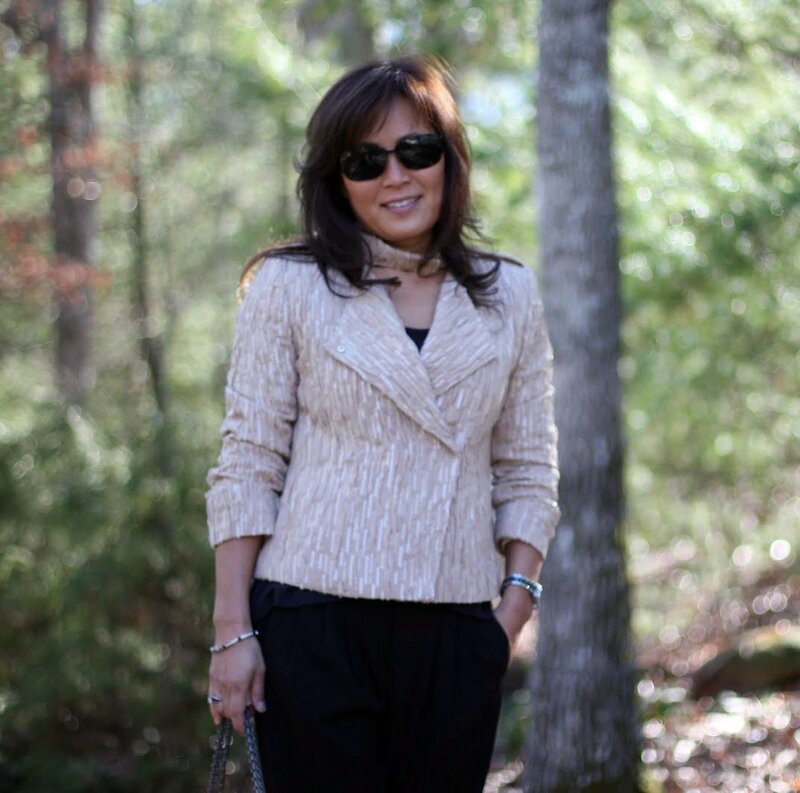 – A designer note on my newly acquired jacket from Ann Taylor. I’m not sure that I would have given this jacket a second look under normal circumstances….even on the sales rack, it didn’t call out my name. It wasn’t until I looked at the price tag that my jaws dropped and eyes popped. Grabbed it and on to the dressing room I marched. By golly… this jacket looks pretty nice! Isn’t that insane? Believe you me, I bought it without a second thought…I would think of what to do with it later. I found the jacket to be more versatile than I imagined. It’s a great little jacket over a LBD (little black dress). It also works well with a pair of black skinny jeans & boots for what I call an “elegant biker.” Yep, I just made that up. Today, I wanted to create an understated & simple look… perfect for a nice dinner and a show. What do you think? Worth $35.93 plus tax? Heck yea! It’s all about the thrill ~ Yeah, baby, yeah! It looks simply wonderful on you, whatever the price. Even better that you paid a song for it! I found a gorgeous red boucle jacket at AT on the sale rack once and I still wear it every season. Somethings are meant to be. Thanks Laura! 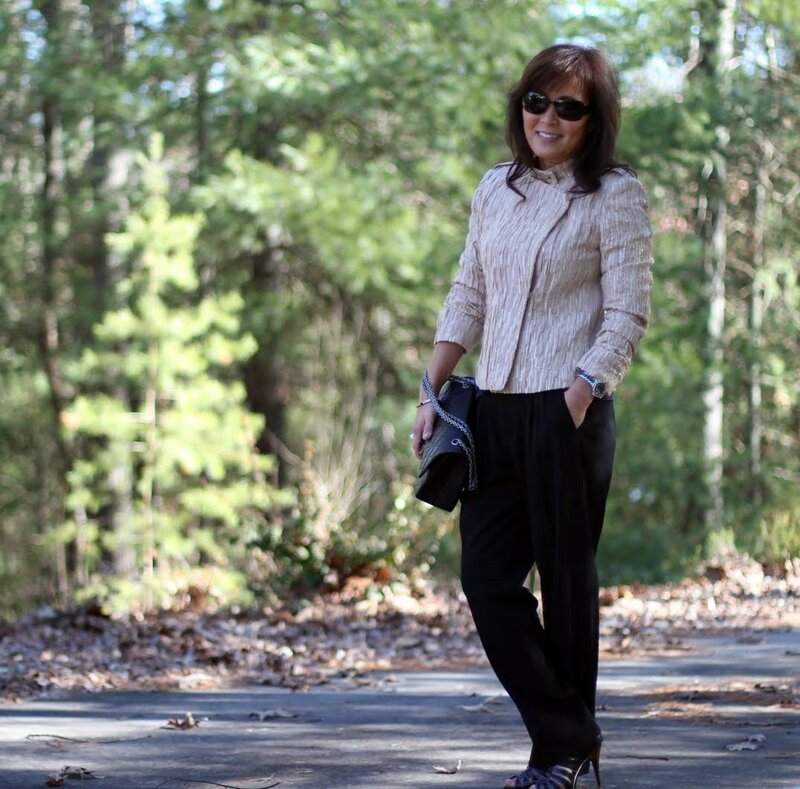 I love Ann Taylor clothing….esp on sale!! 🙂 I hope to make good use of it, just like your red one. Have a great weekend! WOW – not only did you find an amazing jacket, you got a great deal too! 🙂 Really like the way you’ve styled this, such a nice jacket. This is why I’ve never been swayed by the argument that you shouldn’t buy something on sale that you wouldn’t buy at full price. I mean, I get the point. It IS easy to make big mistakes when dazzled by sales tags. But it’s also easy to find something that you wouldn’t have considered otherwise, only to discover that it’s just what you need! Sales are a great way to broaden our horizons in this way. And I LOVE that jacket on you. Enjoy it! Hi Court! I agree. Would have never looked at this one had it not been on sale for such a great price. And I really like it! that was weird….as soon as I posted my last comment the photos finally came through. Great jacket! Ok I want to see a picture. I love Ann Taylor and the Loft clearance sales. I have gotten so many great skirts and dresses over the years at ridiculous prices. Hi Bella! It’s the jacket that I’m wearing in these photos! I wish it showed the sequins and pleats better. Thank you! I love classic Chanel flaps….timeless! I love ths jacket! I love it when the motorcycle jacket is in another material other than black leather–altho l Like that too! I love black leather jacket, too! This one is definitely different. I’m glad to have found it at such a great price! Fantastic! I’d have grabbed it myself. I know…you should have seen the grin on my face. I’m usually not this lucky…they never have my size by the time things go on sale. You turn the motorcycle jacket so glam ! It’s a pretty cool looking jacket….very different. The photos just don’t do justice….very pretty sequins! Thanks for coming by Christel! Don’t you just get excited when you find something you love and can just chip, chip, chip away at the original price! YOU LOOK FABULOUS! Great shopping! Thanks Daisha! Especially the price!